Technicians and demonstrators have a valuable role in supporting the student learning experience within psychology departments. 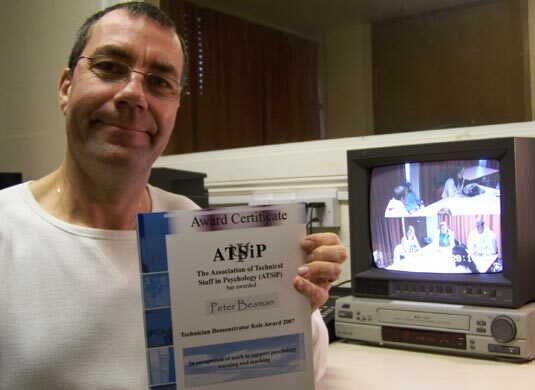 In recognition of this the Higher Education Academy Psychology Network, in collaboration with the Association for Technical Staff in Psychology, ATSIP, sponsor an annual award for a technician or demonstrator who has provided outstanding support for the student learning experience in their department. Peter Beaman from Department of Social Sciences at Loughborough University has been honoured with the award for 2007, for recognition of Peter’s work to support psychology learning and teaching, and in particular his research into the ‘Use of resources and courses for students and staff’ which was presented at the Annual ATSIP conference at Teesside University in June 2006 and his National study of technical Staffs in Psychology from 2007. • Areas of skill: the development of new or use of existing technology in particular areas of psychology (e.g., developmental) or particular kinds of technology (e.g., podcasts) to enhance the psychology student learning experience. • Interpersonal/communication skills: Interaction with staff and students. • Admin/finance skills: the use of new or existing technology to improve administrative procedures or to reduce costs relating to the psychology student learning experience. • Problem solving skills: the development of new or use of existing technology to develop solutions to problems relating to psychology learning and teaching. For example, enabling improved feedback to students; improving the teaching of very large groups; other problem identified by department. • Innovative skills: the development of new technology, or the innovative use of existing technology, to enhance the student learning experience. • Special skills: research or other work concerning the use of new or existing technology that has enhanced the psychology student learning experience.